The Apple iPhone doesn’t have a way to create a signature for a text message the way you can for an email. There are a few apps on iTunes that claim to do this for you, but I don’t recommend any of them. They’re pretty cheesy, cost money and are a pain to use. You have to switch between the text and the app in order to insert the signature. Who wants to add those extra steps and time? Thankfully, I figured out a way to add a signature of sorts to the end of all of my outgoing text messages (and iMessages) using a keyboard shortcut. It only takes a moment to set one of these up and you can easily insert it at the end of every text message. NOTE – This method can be used for any and all phrases you find yourself typing regularly into a message such as a URL, phone number, address or anything else you use often. Just follow the steps below to create a new keyboard shortcut and then use it while you type! Scroll down to find the “Keyboard” field and tap on it. Select the + at the upper-right corner to add a new shortcut. In the “Phrase” field, type whatever it is you want to use as a shortcut or signature within text messages. Keep in mind that texts are supposed to be on the short side, so don’t create something insanely long here. In the “Shortcut” field, type the 2-3 letter shortcut you will use to bring this signature up within a text. When you are finished, tap the “Save” button in the upper-right corner of the screen. 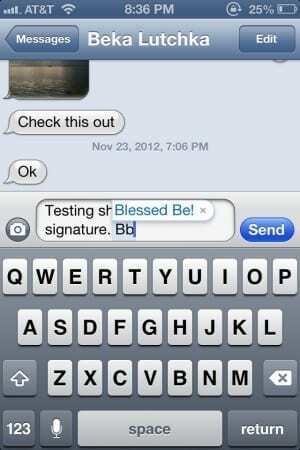 In my example photo above, I chose to have the short phrase “Blessed Be” show up at the end of my text messages. 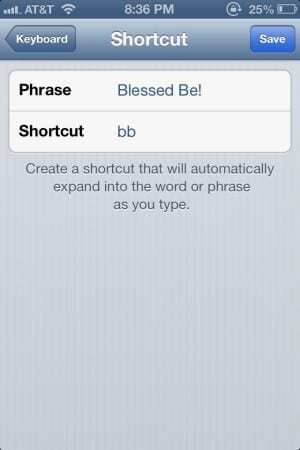 When I am finishing up a text message, I just type bb at the end and my shortcut will pop up. I then simply tap the space bar and iOS places the shortcut/signature within the message for me. You would type this into the Phrase field in the screen to create the shortcut. 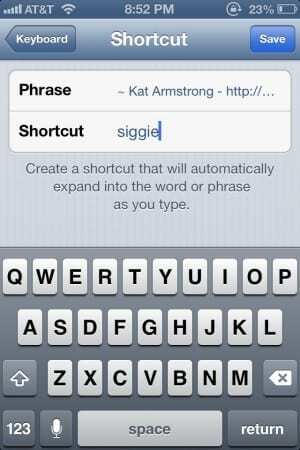 For the shortcut trigger, you could then use something such as “siggie” to trigger it. You can choose to use whatever you’d like as your shortcut “signature” – short is usually always better when sending an SMS. Likewise, the trigger shortcut should be something around 2-3 letters for the most part and easy to remember. You’re trying to save yourself time, not add to your troubles. You get 5 stars! Very Helpful I have an Iphone 5 and this works great ! so easy! Thanks! My first iphone! I’ve been wanting one for a VERY long time. Thank you so much for the “work-around” on the signature. I am a Realtor and have a lengthy signature that would require a lot of repetitive text. So, I created (thanks to you) three phrases, one for each line with the shortcuts of: th for my name; kw for the Broker; tv for my website. I text th and hit enter, kw and hit enter, tv and hit enter then send. Sor much easier! Thanks!!! for making my text life that much better! Thanks Kat for the step-by-step. Now I have a signature. Thanks for showing all the steps involved. Thanks bunches! step by step instruction and visual aid to boot! Now we’re cooking! Thanks so much. It is a pain that this cannot be permanently installed, but at least it is a shortcut to typing the entire closing each time. Awesome! Works great! Thank you! Works a treat! Thank you Kat. It’s still not working. I have an iPhone 6 and I want to add “nolans mom” at the end of every SMS text message why isn’t it working??? Ugh! 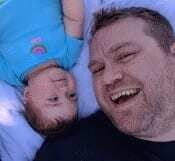 Help a lot. Read so many ideas that were unavailable on my phone. This works. Thank you very much! Thank you so much. That is the most useful information I have gotten for my I-phone. Brilliant! I just switched from an Android which (I miss) and has this feature. A plus over the Android is you can use at will. Mitch! Thank you! This is NOT the first time I’ve used your techni-solutions. And it won’t be the last. Thank you for straight forward and helpful insights. This really helped.. But I wish it could automatically show up without me having to remember to put it in there….. Thank you. This was of great help! No need to type my signature every time. When I had an android phone you could set an automatic signature that entered on a line below the message you typed. Is there any way for that to happen with the iPhone 5s? Your instructions were great and easy-to-follow! Just what I needed.